This video provides a wonderful companion to the renowned Farming Video, which has been seen by thousands, and received awards and many rave reviews. 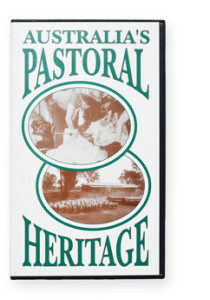 “Australia’s Pastoral Heritage” is drawn entirely from the original high quality 16mm movie footage of Ian Sloane, being all new footage never seen before. The US-based International Videographer Awards conferred an Award of Excellence on this video/DVD in 2003. Specifications: VHS format B/W; PAL; Running time 75 minutes. 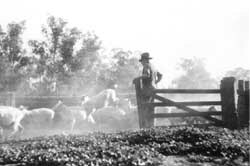 The seasonal routines and daily life of a pastoral property, in the Riverina district of NSW, are depicted in detail, ranging from the arrival of lambs, to shearing (both blade and mechanical), dipping, classing, mustering, droving and selling of sheep. 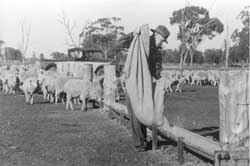 The many challenges of Merino sheep husbandry through devastating drought (1938), torrential floods (1939) and locust plagues provide memorable scenes for the viewer. These consecutive dates still hold the record for the driest and wettest years. 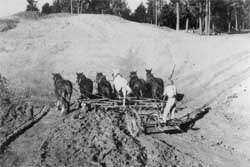 The Clydesdale horse and early mechanised equipment were the power sources for fodder conservation, water storage improvements and stock husbandry. Ian Sloane also filmed the unique native fauna and flora of the natural environment of his property, as well as sheep dogs and stock horses. He also captured glimpses of the lifestyle of a pastoral family and district during the 1930’s, as they spent leisure hours at picnics and sporting events. 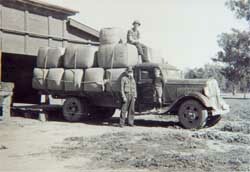 For those interested in the wool industry, rural lifestyles and Australian history, this video is essential viewing. The original silent movie is now accompanied by informative commentary throughout, with a soft folk music background.